I started using essential oils about seven years ago, when my anxiety was out of control and I would try just about anything to calm my frazzled nerves. Lavender essential oil became my BFF that year: I kept a bottle in my handbag, mixed it into sweet almond oil as a body moisturizer, added it to hot baths, and basically dipped myself in it daily. It wasn’t until recently that I considered carrying a “tool kit” of essential oils on the go for aromatherapy remedies. Last Valentine’s Day, I woke up with all the stress migraine warning signs on our biggest delivery day. I dragged myself into the flower shop with my sunglasses on, feeling anxious, achy, and miserable. My mother-in-law gave me a cocktail of essential oils to apply to my temples and forehead, and within 30 minutes I relaxed enough to forget about my headache and power through the day. Lavender – Lavender was reportedly used in ancient times to tame lions and tigers, so imagine what it can do for your moderate stress. Also helps relieve headaches and sore muscles. Peppermint – Soothes motion sickness and nausea, reduces headaches, eases sinus pain and congestion, boosts energy and alertness, and wards off stress and anxiety. Lemon – A refreshing mood-lifter and energizer. Eucalyptus – A lifesaver for sinus pressure and congestion. I use them alone or blended together, and typically use just a drop or two — either warmed in my hands and breathed deeply or applied to my temples. If I need extra ‘oomph’ I mix them with sweet almond oil (stored in a small glass bottle with a tight lid so I don’t have an oil spill in my handbag) and rub them into my chest and/or the back of my neck for tension, or directly onto tired sore muscles. I started using essential oils the same way! I was on vacation and my anxiety was horrible, stressing out about work. I had lavender oil with me and put it on my temples, re applied every 20 min. Sure enough, my anxiety was gone! I absolutely love lavender and peppermint! Peppermint oil is GREAT for headaches, I just started doing this recently. LOVE, LOVE, LOVE!!! I start back at work next week and this sounds like the perfect idea to help keep me relaxed throughout the season! Thanks! Thank you posting this. I’ll have to keep this handy! I love this write up! Definitely going to buy some oils now! I’ve wanted to start making more of my own bath and beauty products (now that we’re buying a house, we’re in super-saving-money-mode) and these links are super helpful! I never knew where to start and I figured it would be just as expensive to buy the oil as it would be to buy the products themselves. Now I don’t have any excuses! 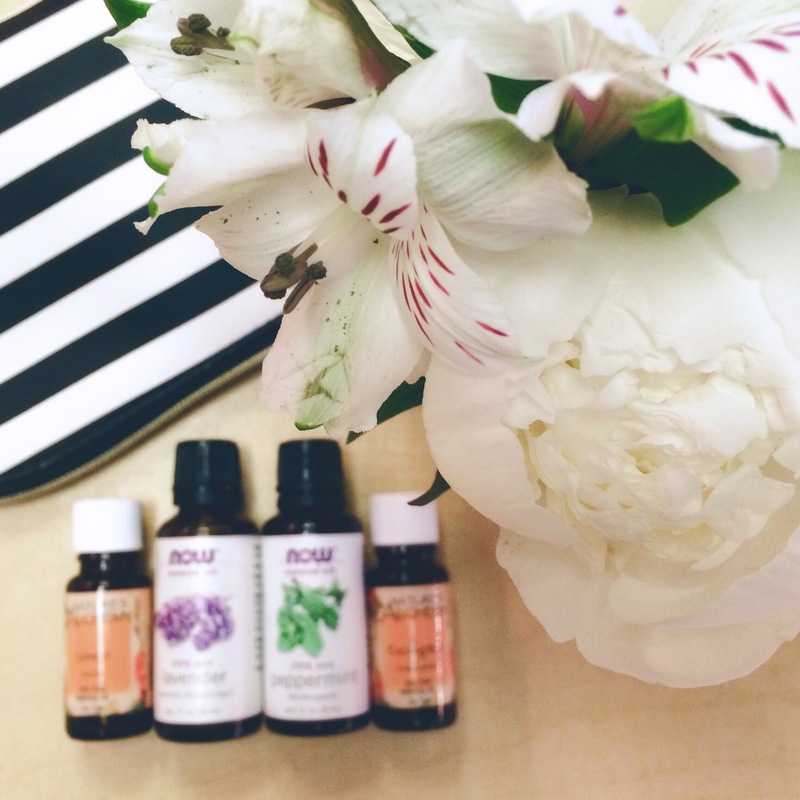 I started using essential oils much like you do – straight on my skin. As I did a bit more research, I found out that they should all be diluted in a carrier oil (especially peppermint!) to avoid causing damage to your skin over time. And to avoid any over-doses of whatever essence you are enjoying. At first I thought this was nuts, but I find them just as effective, if not more, in a carrier oil! And I get the added benefit of a little moisturizing love at the same time. These four are a great place to start! And they’re all relatively inexpensive; I bought these at my local health food store for under $10 per bottle. My sister has anxiety and isn’t able to take her medication. I wonder if something like Lavender essential oil might work for her too! Thanks for the idea! My anxiety is mild to moderate, and I haven’t taken medication for it before so I can’t say for sure how effective it will be for her, but I always think that natural remedies are worth a shot. It can’t hurt to try! Lavender and peppermint are my favorites for stress and anxiety. The lavender calms me, and the peppermint helps me focus. That’s great advice. She’s pregnant and not allowed to take her meds so she’s struggling a little. I’ll pass this on to her! I have yet to use essential oil. Amazingly just this morning I told my Sister we should share essential oil tips since we are both just starting to dip our toes into the pool! I say this post at just the perfect time and will pass it along to her! Thank you! Great post, as a child I would get migraines almost daily, as I get older I don’t get them as often, but when I do, it’s a doozey. I will be trying these oils on the next one.